I have a thing for Japanese racing flats. 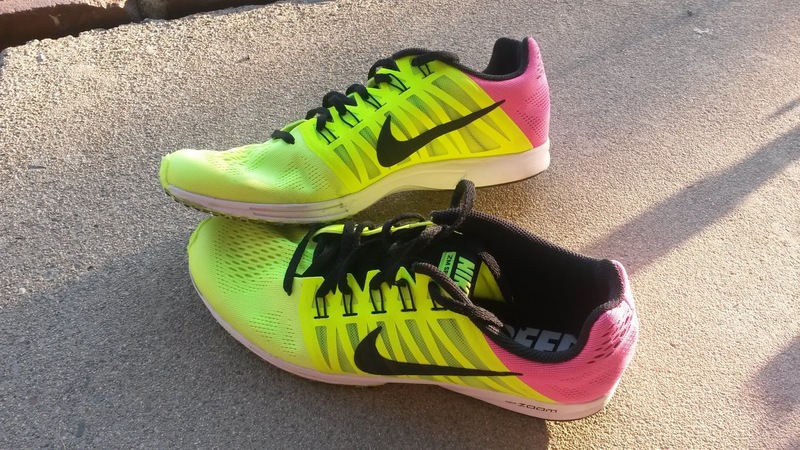 I was an early reviewer in the US of the Nike Zoom Speed Rival series prior to them being brought over to the US. I love(d) the Takumi series from Adidas (which per rumor may be discontinued) and have been fascinated by many of the Asics distance racers (of which I have yet to try any). I have seen the Zoom Speed Racer series for some time but had not tried them, only having run in the Nike Lunarspider series (R6 REVIEW). I have hesitated to purchase the Speed Racer series via Japan's version of Amazon, Global Rakuten due to the long wait times (getting through customs) and high shipping fees. When I found a pair of men's 9.5 on ebay, I decided to take the plunge to find out what this shoe was about. 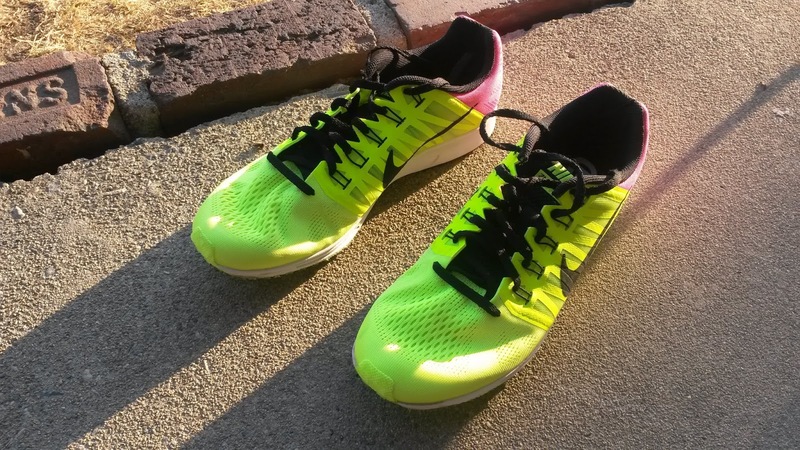 My hope to was replace what I felt was a large step backwards for the Nike LT series (LT3 REVIEW). Did the Speed Racer do it? Yes, sort of.... (read on). My first piece of advice is to purchase this shoe true to size. I was hoping since the Lunarspider R6 fit a little long, that I could get away with a size 9.5 (I could not find a size 10). The result is that I can handle a 9.5 for 3-4 miles running without socks (to reduce inner volume) but they are a little too tight right now for racing longer distances. I have been using these for my after work short treadmill runs prior to core and strength work where I am doing my Orthopedic Residency. For those short miles they have been ok but definitely tight. If you have them available in your size, I would stick to your normal size (I am normally size 10 in most shoes). Besides that, the mesh around the forefoot is reminiscent of the Nike Streak LT 2 but a little softer and thicker. 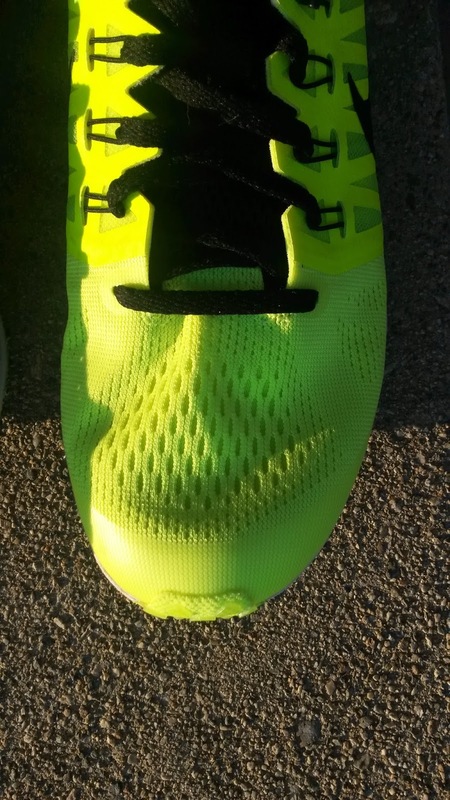 There is a flexible toe guard up front that luckily hasn't irritated my toes too much. There is flywire in the midfoot that does a decent job holding the foot onto the platform. The flywire does do well despite the classic Nike Japan method of not having a final eyelet to lace lock the shoe. Covering the flywire is a plastic mesh that appears very durable (NOTE: I have seen very little wear in general on these after 26 treadmill miles). There is a heel counter in the shoe that is fairly posterior. However the heel counter can be felt through the upper, especially without socks. So those with sensitivity back there should be a little careful. I have lost a little bit of skin there but not anything extreme. There is decent room in the forefoot thanks to the forefoot mesh and the rest of the shoe fits similar to the Streak LT 1-2 (if not a little snugger but that could be due to the 0.5 size small for me). The upper aspect of the heel does have an achilles split but it does come up fairly high. 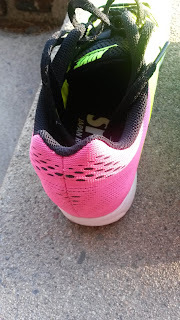 I have had some abrasion on the back of my heel running sockless in these, so if you do get them, I highly suggest wearing socks for the achilles area (or taping the area which I have found to be one of the few good uses for KT tape). What I found interesting was looking at the sockliner. For those using custom orthotics, know that the sockliner is not removable. As per many Japan racers, there is not much of an arch. So for those sensitive to that, you may want to take a look (if this shoe is available to you). The sole almost reminds me of the Streak LT series before version 3, but more structured. There is a midfoot shank that feels like it extends into the forefoot (not sure on this). 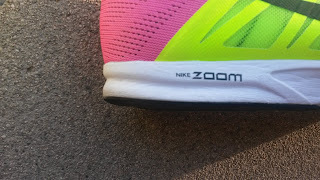 There is a Air Zoom unit in the heel and I do not feel one in the forefoot. The sole is a little firmer than the previous Streak LT series but is definitely more snappy. The toe-off has a propulsive feel and the outsole rubber is definitely firmer, leading to a much more stable ride. 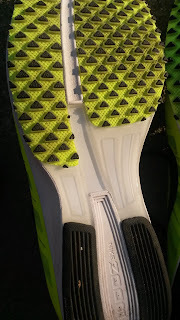 The nubs in the front have not fallen off yet and provide great traction (at least on treadmills). 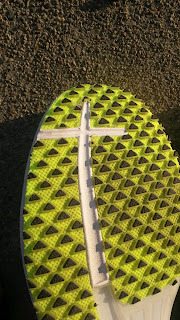 The outsole rubber in the heel has next to no wear and makes me think this shoe will last for some time (at least until the nubs in the forefoot start coming off like the Takumi series). There is a fairly similar amount of (if not slightly more) sole than the Streak LT 2. 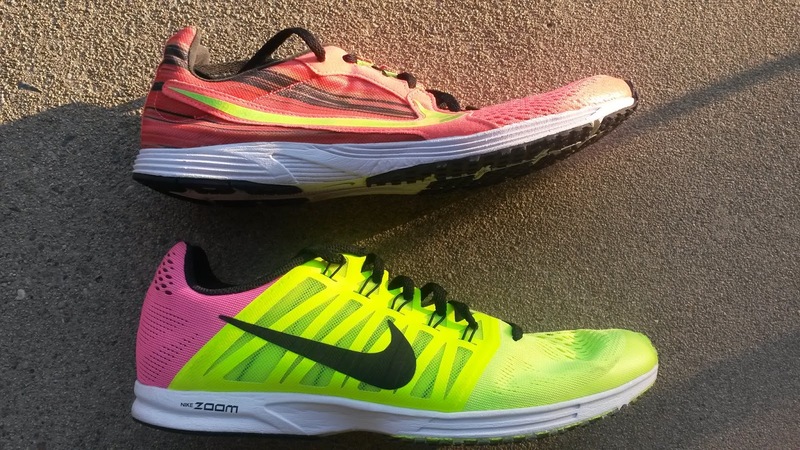 The Zoom Speed Racer 6 does feel a little heavier than the LT 2 but again is more snappy and stable. 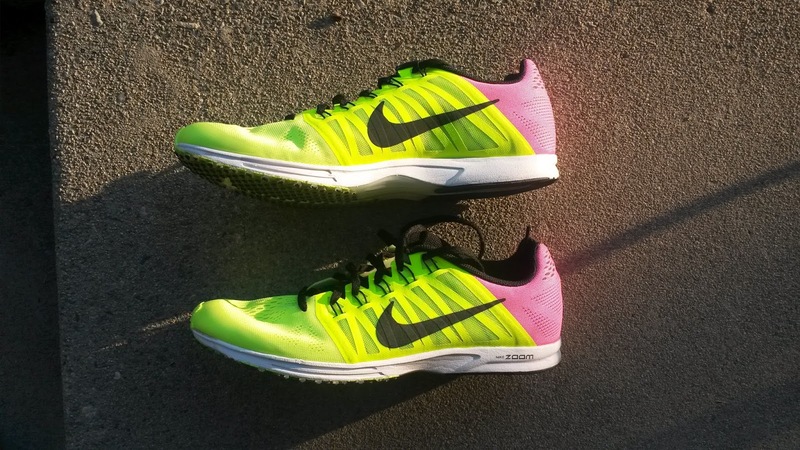 I would definitely choose this shoe for a majority of my races if I had the correct size due to the balance of propulsion with a stable ride. The more stable feel may also come from the slightly wider sole and straighter last versus the LT 2. The Zoom Speed Racer 6 is not a flexible shoe but does have a flex groove farther anterior. If it actually works I do not know. Personally I would have put that flex groove on the medial side to facilitate hallux extension but unfortunately I am not that deeply involved with footwear development yet. I might have to eat my words on midfoot shanks as I have really enjoyed how much more stable the Speed Racer 6 feels with it. 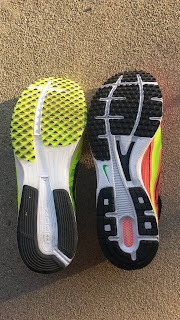 I think this is a little different (and I could be wrong), but it feels like the shank extends into the forefoot given how stiff the forefoot also feels. This is something I am missing from many current racing flats. 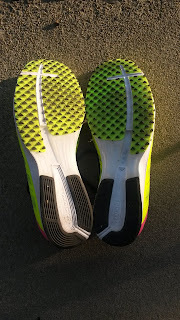 Many companies are keeping the shanks only in the midfoot, but I would like to see more extend it into the forefoot like the older Takumi series (prior to version 3), the older Adios series (prior to the Boost 3) and the recent Zoom Fly and Vaporfly. The major reason for this is to that I want them to fully imitate the plantar fascia. The plantar fascia is the natural carbon fiber plate of your foot. It begins in the heel and extends all the way into the toes. It is not an active contractile tissue but serves as a passive structure that transmits forces from your calves to assist with forward propulsion. It works best when you have decent 1st MTP joint mobility (at least 60-90 degrees. More like 70-90 for runners) as that helps tighten the plantar fascia correctly and creates something called the windlass mechanism. This helps elevate the longitudinal arch and is one of the many ways to stabilize the foot during midstance to toe off (among other areas of gait depending on who you ask). For those of you struggling with chronic irritation of this area, among many things, I find chronically tight, shortened or overused calf muscles to be a culprit. Not always, but frequently given the force transmission relationship between the two, it is a concept I remember frequently when treating in clinic (among many other things). I will say that anecdotally I have found this relationship stronger in younger individuals and less so in the older population. Given the structure of the plantarfascia and the origin and insertion, plates I think should extend into the forefoot. This was done decently in the recent Zoom Fly from Nike (REVIEW) but needs to be further tweaked as it does seem to irritate some people's feet. That may be due to a variety of other individual biomechanical reasons, but I think the closer shoes compliment the foot, the better. ***Disclaimer: These shoes were a personal purchase and were bought on ebay. This in no way changed or influenced the honesty of this review. I put at least 50-75 miles on trainers and 25 miles on racing flats. 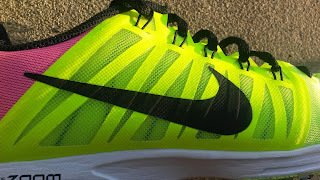 Currently my pair of Nike Zoom Speed Racer 6's have 26 miles on them all on treadmill at the moment.